Choosing the right plastic bag can be daunting given the number of choices. However, armed with some basic information, you'll be able to choose the right bag for your needs! We offer plastic bags in several different materials. Because each type of plastic has specific characteristics, understanding the differences can help you narrow your choices. HDPE features a variety of qualities that make it one of the most common plastics used in the world and many of these qualities translate to making it an excellent material for plastic bags. HDPE is light-weight, resistant to temperature, water, and vapor, has high tensile strength, is relatively transparent, and meets FDA/USDA food handling guidelines. These qualities combine to make versatile bags that are excellent for both serving and storing food in retail and take out situations. HDPE plastic food bags will allow your grocery store, convenience store, deli, or restaurant to work with greater efficiency, no matter how you choose to utilize them. This type of plastic is commonly used for food bags and utility bags. Because low density polyethylene is breathable, products stored without refrigeration or freezing will not last as long, compared to a polypropylene bag. 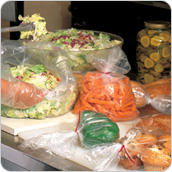 Though not as strong as HDPE bags, LDPE bags are capable of storing bulk food items like fresh vegetables and fruits. Additionally, the clear plastic makes it easy to identify contents, so you can keep up in the fast-paced setting of a commercial kitchen. Highly versatile, the low melting point of LDPE makes these bags popular for use with heat sealing. 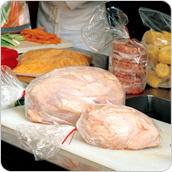 Like HDPE, LDPE meets FDA/USDA food handling guidelines. The biggest difference between LLDPE and LDPE plastic bags is that LLDPE food bags have a thinner gauge, but with the same strength. For example, a 0.85 mil thick LLDPE bag has the same strength as a 1.5 mil LDPE bag, allowing the user to "down-gauge" and save money! Similar to LDPE bags, LLDPE bags can be used for storing food in both refrigerators and freezers and the meet FDA/USDA food handling guidelines. 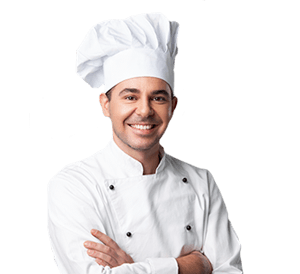 These bags also allow for easy identification, and, as a highly versatile product, they are perfect for use in commercial kitchens. 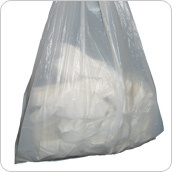 Polypropylene bags combine excellent chemical resistance and strength. Unlike LDPE or LLDPE bags, polypropylene bags are not breathable, resulting in longer product shelf life for retail situations. Items like herbs, nuts, candies, and other confectioneries are perfect for storing in PP bags. Additionally, polypropylene bags are clearer than LDPE or LLDPE bags for enhanced product visibility. PP bags also have a high melting point, meaning they are great for heat sealing, and, similar to the other plastic food bag options, they are FDA/USDA approved. Gauge is the term used to describe the thickness of a plastic sheet, or in this case, bag. It's usually measured in mil's or microns. Generally, a higher gauge food bag should be used if the contents are particularly sharp or heavy. The higher the gauge mil or micron, the thicker the bag is. Side Gusset: This style of gusset allows the bag to expand into a box like formation when it's fully packed. This allows for more efficient storage than other style bags. Side gusset bags have many uses and come in a variety of sizes. Bottom Gusset: The bottom gusset allows a bag to stand up while being filled. Bottom gussets come in round bottom, k-seal bottom, and plow bottom; the differences in these styles being how the gusset is sealed. This style is generally considered to be the most appealing gusseted bag. Bottom gussets do sacrifice volume efficiency when compared to side gusset bags. Flat Bag:This style of bag doesn't expand as much as side or bottom gusset bags. Flat bags are ideal for small, lightweight items such as cookies, pretzels, chips, or candy. There are several common seal styles available for food service bags. Flip Top or Tuck Top bags may also be referred to as "Flip and Lip". This style is common in deli saddle bags and sandwich bags. To close the bag, the extra "flip" material can be tucked and rolled into the "lip". 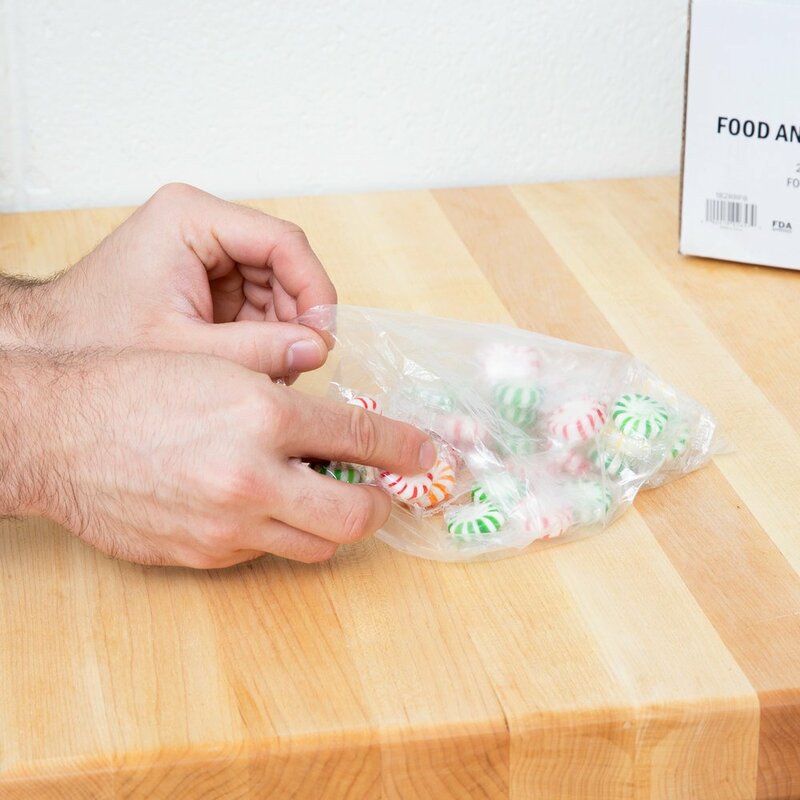 Seal Top, or recloseable, bags close securely to seal in freshness better than fliptop bags, or bags that close with a twist tie. Seal tops are available in sandwich, deli, and storage bag styles. Slide Seal bags are similar to seal top except they feature a small plastic "zipper" to close the seal, resulting in a more secure closure. 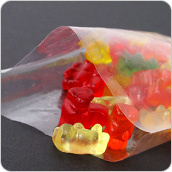 Slide seal bag styles commonly include sandwich, deli, and storage bags. 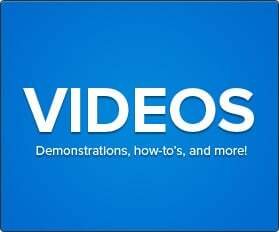 This section discusses the main types of plastic bags we carry along with some purchasing considerations. Deli Saddle Bags are available plain or printed, with your choice of closure style. They're usually HDPE and can be used with a saddle bag stand for easy dispensing. Deli saddle bags are mainly designed for the sale of sliced deli meats, cheeses, and vegetables, but are also great for cookies, sandwiches, rolls, or other similar items. Recloseable Food Bags, whether in seal top or slide seal configuration, are most often used for food storage or portioning where the bag will be opened repeatedly. Recloseable food bags keep products fresh longer, and are most often used to portion or store vegetables, cereals, dry ingredients, crackers, cookies, lunch meats, sandwiches, and other similar items. Write-On Blocks, available on some recloseable bags, allow employees to clearly label the contents for easy organization and identification. Hang Holes through the tops of some recloseable bags (above the seal) allow the bags to be hung on racks in retail merchandising situations. Dispenser Boxes feature a perforated cutout opening for neater, easier dispensing of your recloseable food bags. Plastic Bread Bags are similar to regular plastic food bags in terms of gusset styles. However, they're usually specifically sized for common types of bread, such as French bread or 1 lb. loaves. 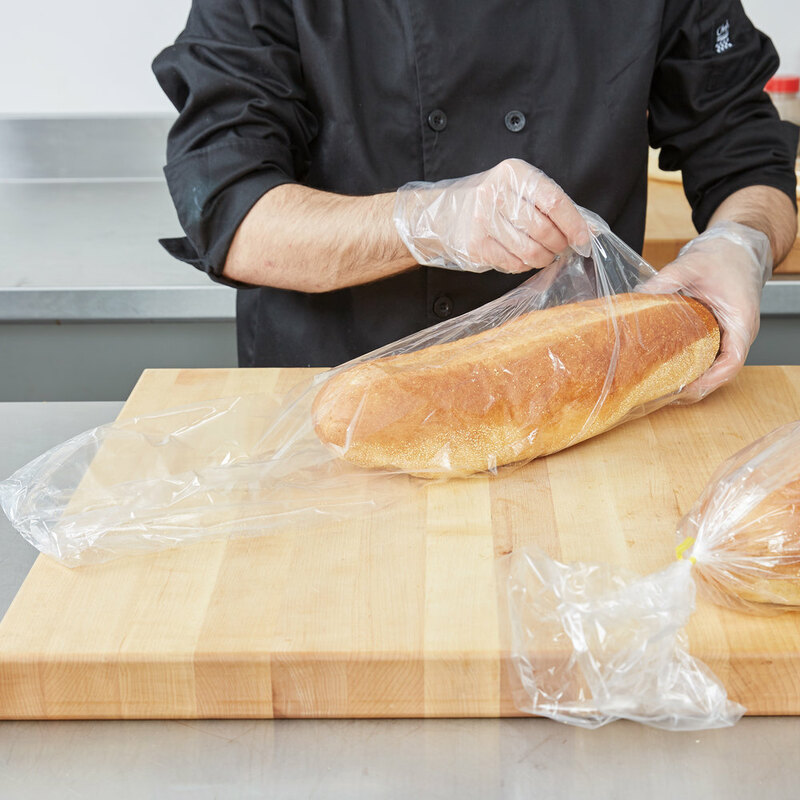 Micro Perforations available on several of the bread bags we carry allow excess moisture to escape while letting a small amount of air in to keep crusty breads crusty! T-Shirt Bags are versatile and widely used in a variety of retail situations from grocery stores to convenience stores, take out restaurants and even markets. Made of HDPE, the most common t-shirt bag sizes are 1/6 (22" x 7" x 12"), and 1/8 (18" x 5" x 10"). We provide t-shirt bags of varying color for any situation or theme, and we even have "Thank You" bags for an added touch of customer appreciation. We also offer convenient t-shirt bag racks that keep your bags organized and tidy in your front- or back-of-house area. We also offer a "green" option for those looking to be environmentally friendly. Our Green Herc biodegradable t-shirt bag utilizes an oxo-biodegradable additive to assist in the break-down process, giving it a faster rate of decay than normal plastic t-shirt bags. Bags on Rolls are available for several food service applications. For example, produce bags on rolls dispense easily and take up minimal shelf space. Additionally, several of our sandwich bags and other food bags come on rolls for easy dispensing when used in high volume pre-packaging applications. Additionally, some of the bags without seal tops include twist ties to provide you with a secure closure for increased freshness. For bags that don't have twist ties included, twist ties can be found here. Commonly used for decorating cakes, cupcakes, and other baked goods, pastry bags and tips are versatile tools that can be used for many different tasks in the kitchen. 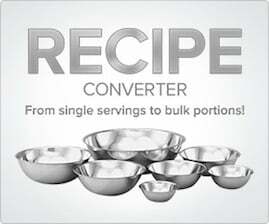 For example, you can use pastry bags for piping mashed potatoes, meringue, dough, and much more. In this guide we’ll go through the different types of pastry bags and piping tips and what each is used for to help you find the perfect options for your bakery or catering business. 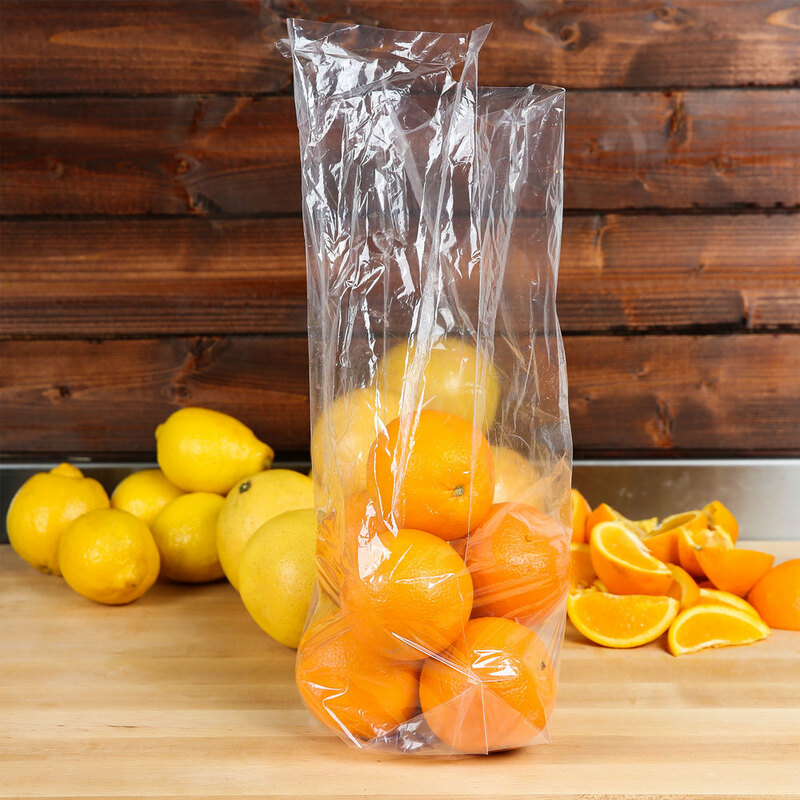 Reducing food waste and spoilage is important to any foodservice operation, and vacuum packaging is a great way to do just that! Vacuum packed products can last up to 3-5 times longer than non-packaged foods, and they will also taste fresher because you're removing most of the things that cause them to break down. Best of all, you only need a commercial food sealer and some compatible bags to get started. 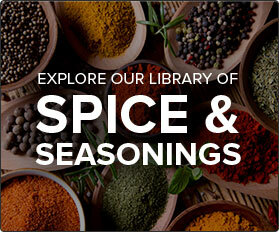 Use this guide to find the right products for your needs. From sandwiches to steaks, and everything in between, food of all forms needs to be packaged properly to preserve freshness and ensure safe handling. 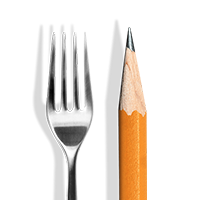 Knowing which type of food wrapping paper to use for your application – butcher paper, freezer paper, sandwich paper, or wax paper - is vital to delivering a quality product to your customers. That's why we've created this handy guide. 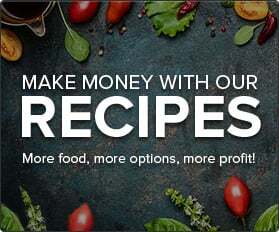 Use it to discover the various types of paper food wraps available to you, and then determine which one is right for your unique needs.